The intent of the Moriarty-Edgewood School District Board and the superintendent for the district is to close 40% of the elementary schools in the district. Thus far they have been denied this drastic measure by the New Mexico Public Education Department (PED). They have attempted to further or bolster their case with supplemental submissions which are now being considered by the PED. 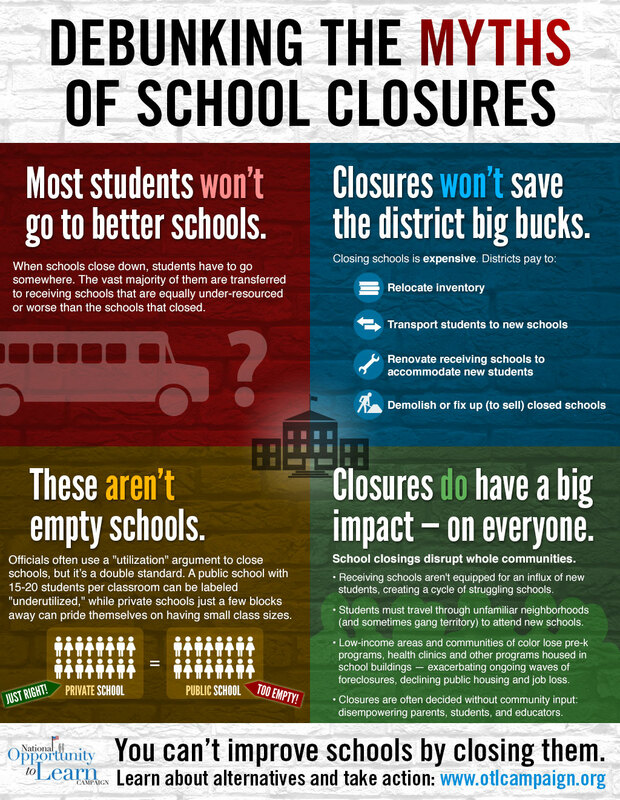 We are posting the “infographic,” found below because we believe it contains valid points against school closures. This infographic and others to follow were developed when massive school closures occurred in several large cities in the United States. Not everything contained in the infographic series will be applicable to this district, but each infographic provides food for rational thinking. I have to dash off to court for a speeding ticket and to prove I have insurance—which I could not find proof of when the officer stopped me. So, I am getting this out a bit early today. This week’s column, Three hours of Waterboarding (attached and pasted-in-below) is a bit long, I know. I’ll have a hard time editing it down for the newspapers. But it combines two things: the story of my taping for the Daily Show with Jon Stewart (which lots of people have been asking about) and the real content about fracking and how the left works. I hope you will find it to be an interesting read. Please post, pass on and/or personally enjoy: Three hours of Waterboarding. On Thursday, February 27, I received an email that said: “I’m a producer at the Daily Show with Jon Stewart. We’re working on a segment about fracking & I wanted to reach out to see if you’d be interested in participating. I read your column in Town Hall a few months ago & it’s just what we’re looking for—we’d like to have someone dispel a lot of the myths & untruths about fracking.” I responded that, yes, I was interested. After doing my research, I agreed to participate. On March 6, I flew to New York City for a taping on March 7. I knew that the Daily Show is a comedy show masquerading as a news program. My peers told me horror stories of how the show had treated others whose views didn’t mesh with those of Jon Stewart—not that the guests were personally abused, but that the final product didn’t represent what was really said during the taping. I weighed the pro and cons and decided to take the risk. I figured that no matter how good I might be, I was unlikely to change the opinions of the young audience that watches the Daily Show and thinks it is real news. Additionally, my audience doesn’t generally watch it—and if they do, they’ll know my comments were heavily edited, as my views are well known. What really pushed me to accept the invitation was the fact that the following week, March 10-13, I was scheduled to be in Southern California speaking on college campuses and my Daily Show taping would enhance my “street-cred” with the potential audiences. I knew I was not the first person to whom they had reached out. Others had turned them down. If I said “no,” they’d continue down some list until they found someone who’d say yes. I figured it might as well be me because I know that I know my topic. I know I will represent it accurately. The next person on the list might not be as well informed. I expected that they’d try to spring something on me and make me look foolish. Based on the pre-taping interviews, I felt that I had a sense of where the interview would go. They had a few questions about which I was unsure. I sent an email to the several thousand people on my enewsletter list asking for input on specific questions. Many sent me helpful information that I read on the plane on the way to New York. I talked to industry experts. I studied up as if I was heading in for a final exam. I wanted to be sure they couldn’t trip me up. When I walked into the offices of the Daily Show, I felt that I was ready. I told them: “I know your job is to make me look bad, but mine is to be sure I look good.” I wore a favorite red silk blouse with gold jewelry. The team was very kind to me. They shot some “B roll” of Aasif, the correspondent who’d be doing the interview, and me walking toward the room where the taping would take place and some of me working at a computer. I was escorted to a dark, dreary-looking room with camera and sound guys, and Jena, the producer. The interview started straight enough. They asked one of the questions they’d asked via telephone: “Why do environmentalists hate fracking?” I explained that I didn’t think it was really about fracking, as thousands, if not millions, of wells had been drilled using hydraulic fracturing since modern techniques were developed in 1949. I pointed out that a primitive form of fracking was done in the late 1800s when a nitro glycerin torpedo was dropped down a well hole. Despite this long, safe, and prosperous history the frack attacks had started in October 2007—shortly after the technologies of hydraulic fracturing and horizontal drilling were successfully combined and began to unleash America’s new energy abundance. I continued: It is not really about fracking. It is about fossil fuels—and hating them. The average person doesn’t have a clear understanding of the role that energy plays in their lives (which is why I do what I do). All most people know about energy is the price of gasoline and they know “drill, baby, drill.” They know that increased production of oil translates to lower prices at the pump. So the anti-fossil fuel crowd can’t come out with an anti-drilling campaign, but they can use a term that sounds scary and that people do not understand: fracking—the vernacular for hydraulic fracturing. Once they had scared people, those against fracking set out to stop the procedure—with the ultimate goal of banning it all together. Since 96-98% of all oil-and-gas wells drilled in the U.S. today are stimulated using hydraulic fracturing, banning fracking essentially bans oil-and-gas production. Aasif asked about fracking accidents. I asserted that there were none that I was aware of and cited the fact that three leading Obama Administration secretaries—hardly fossil-fuel fans—had declared fracking to be safe: former Secretary of Energy Steven Chu, former Secretary of the Interior Ken Salazar, and current Secretary of Energy Ernest Moniz. When we were about to wrap, they thanked me and, on camera, gave me a pizza. Once I was back at my desk, I did a search on Chevron, accident, and pizza. The story came up. It wasn’t a fake accident, but it also wasn’t a “fraccident.” While the exact cause of the Greene County, PA, well fire is still under investigation, the local news reported: “Chevron had previously completed drilling and hydraulically fracturing, or fracking, the well and was in the final stages of using steel pipe to hook it up to a pipeline distribution network for production.” The Pennsylvania Depart of Environmental Protection’s (DEP) Scott Perry stated: “the problem may have come from a defect in the wellhead itself. Chevron’s wellheads are ringed with collars that have set pins running horizontally through them.” Perry says one of the pins may have blown out of the collar, releasing the gas. Apparently, according to the DEP the “gas well explosion is the first serious Marcellus shale well blowout in our region.” Houston-based Wild Well Control, which responded to the Greene County accident, says in the past year it responded to five-surface well blowouts accompanied by fires. The statistics suggest major fires are relatively rare. Thank you, Daily Show, for flying me to New York and taking good care of me while I was in town. Thanks for giving me the opportunity to talk about hydraulic fracturing and alerting me to Bobtown Pizza. Without the March 7 taping, I wouldn’t have told the story of the anti-fossil fuel crowd’s efforts to ban fracking and exploit the good people of Bobtown. While it felt like three hours of waterboarding, I believe I’ve been able to make some good come from the experience. I can’t wait to see how they turn three hours of recording into a 3-5 minute segment when it airs in late March or early April.